Last summer, I spent a week writing about a few homemade drinking vinegars, boozy infusions and fruit syrups that can be stirred into fizzy water, cocktails and other cool drinks. This summer, I wanted to feature more of these refreshing sips (though I still can’t get enough of the Rosemary Lemon Syrup I wrote about during that time last year). However, since this has been something of an intense summer, I knew I wouldn’t be able to do it all on my own. So I invited some of my favorite preserving bloggers to join in the fun and contribute to Drink Week 2012. They were game and have been brewing, infusing, fermenting and simmering up some mighty tasty things for the last week. Check back to this post daily, I’ll be linking up to all the contributors as each of their posts go live. July 25: Jamgría! from What Julia Ate. It’s a riff on the classic white sangria, using a spoonful of jam as sweetener. July 26: Carolina Paradigm Shift from Meg at Grown and Resist. Homemade watermelon juice is key. July 27: Plasma Mary from Sean at Punk Domestics. He uses his stash of tomato water to make a cocktail that has plenty of tomato flavor, but without the density of a Bloody Mary. July 28: Chellinis from Kaela at Local Kitchen. Instead of using the more traditional white peach puree, she combines strained cherry puree with prosecco for a tasty sip. July 29: Canadian Lemonjack Cocktail from Well Preserved. This cocktail is sweetened with maple syrup and includes bitters that you could certainly make from scratch. July 30: Blueberry Ginger Shrub! July 31: Another offering from Punk Domestics! This Balsamic Cherry Vermouth is a fantastic home bar building block! August 2: Fermented Peach Vinegar Tonic from Kate at the Hip Girl’s Guide to Homemaking. This includes a most awesome tutorial to home-fermented vinegar. August 3: We wrap up Drink Week with a Concrete Kiss from Culinaria Eugenius. She combines Becherovka, an herbal liqueur from the Czech Republic, with the syrup and fruit from a jar of brandied apricots. Mmm. Awesome!! Looking forward to reading some of these…. and Rosemary Lemon Syrup? I missed this posting! Yum! I can’t wait to try some new recipes. I tried my first drinking vinegar at Whiskey Soda Lounge here in PDX and it was amazingly good. I’d love to make something like that at home. Love the idea of this!!! I tossed some dehydrated ginger bits into the end of a bottle of vodka. No simple syrup, just dried ginger bits. It makes for a really nice dry ginger taste without the heavy sweetness of a lot of liqueurs. 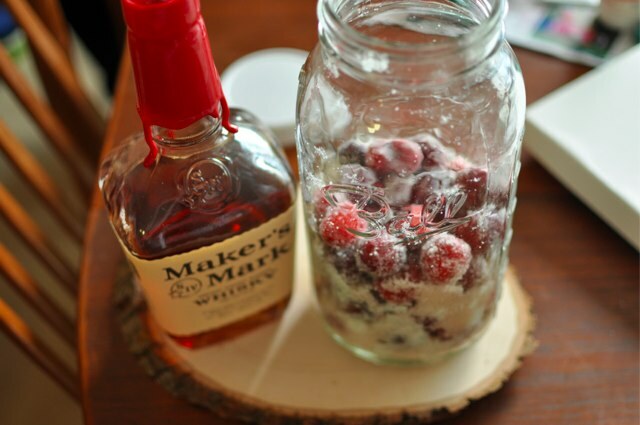 It also makes for a nice mixer without having to layer multiple simple-syrup-laden parts together. I use it in my pancake and french toast batter, and in weekend smoothies – dark berries, lime juice, cran-rasp (or blue or pomegranate), and a bit of ginger vodka. Not so much on work mornings though! I hope you will consider enjoying those drinks in one of our new reusable red cups. They are dishwasher safe and can be used over and over again. We even have a red cup on a wine stem which would be perfect for these canned concoctions!